My name is Sanjana Priya , I am 2 years old. I would have lived a healthy life like all of the kids of my age but unfortunately something else was written in my fate. 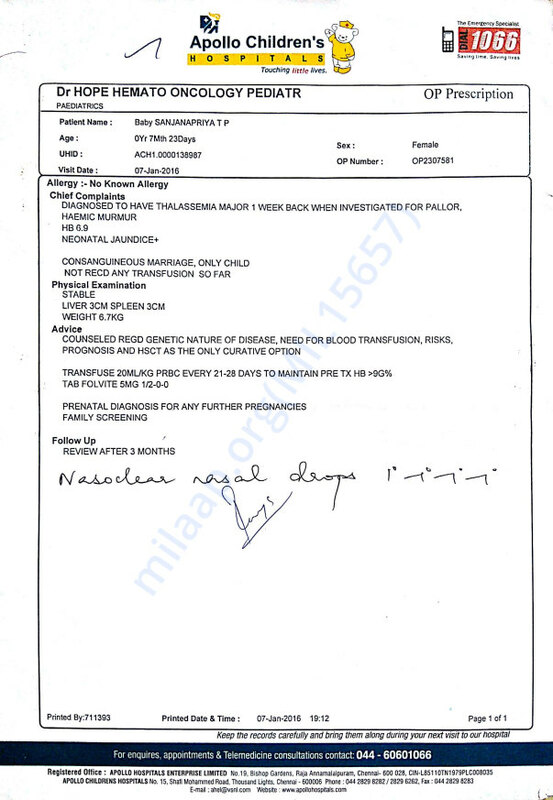 I was born with Thalassemia Blood Disorder which is an inherited blood disorder caused by abnormality in the genes. 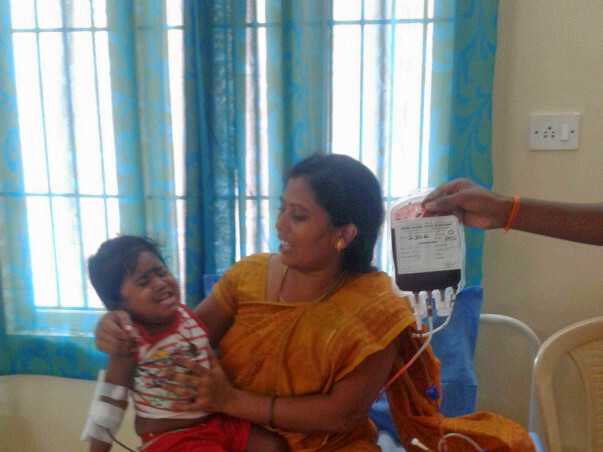 My treatment is going on regularly in govt hospitals and has been on regular Blood Transmission in 15-20 days since my early infancy. 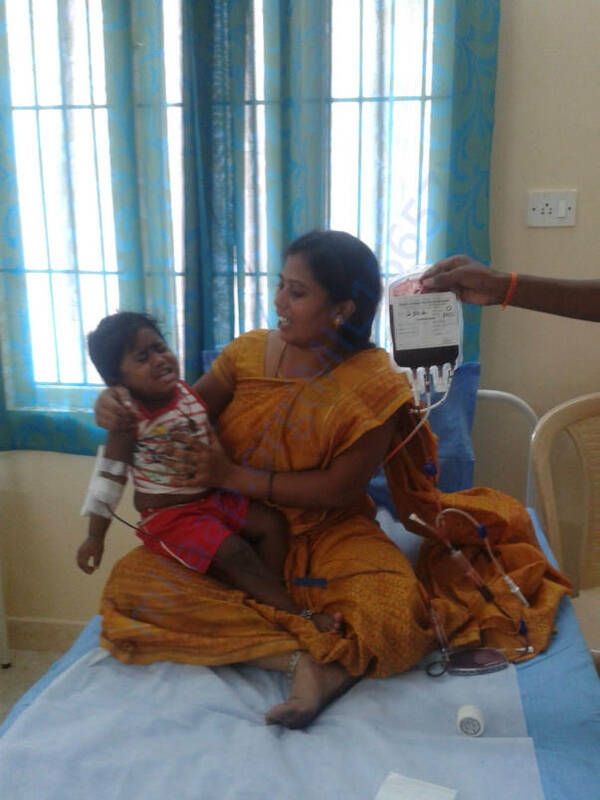 The iron level will increase in every blood transfusion and we use another medicines for maintaining that iron level. I am on the dosage of Desirox - 500. 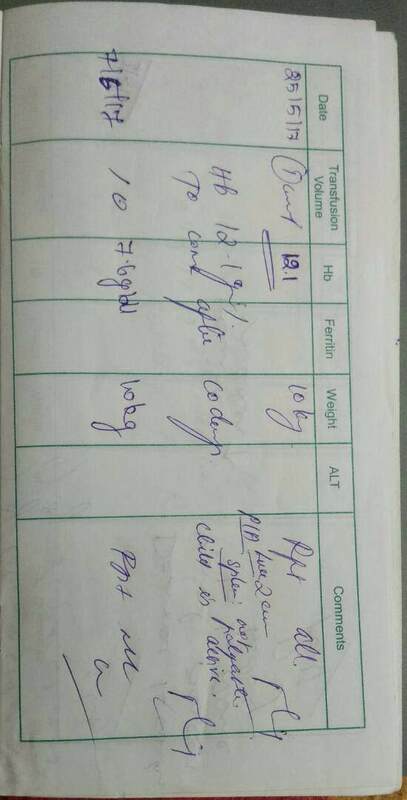 My monthly treatment cost is approximately Rs.10,000. We are facing financial crisis due to my ongoing treatment but I am proud of my father that he strives hard to arrange the financial aid required for my treatment. The doctors told that the Stem Cell Transplantation (BMT) would be the only curative option for this condition and it should be done as early as possible. 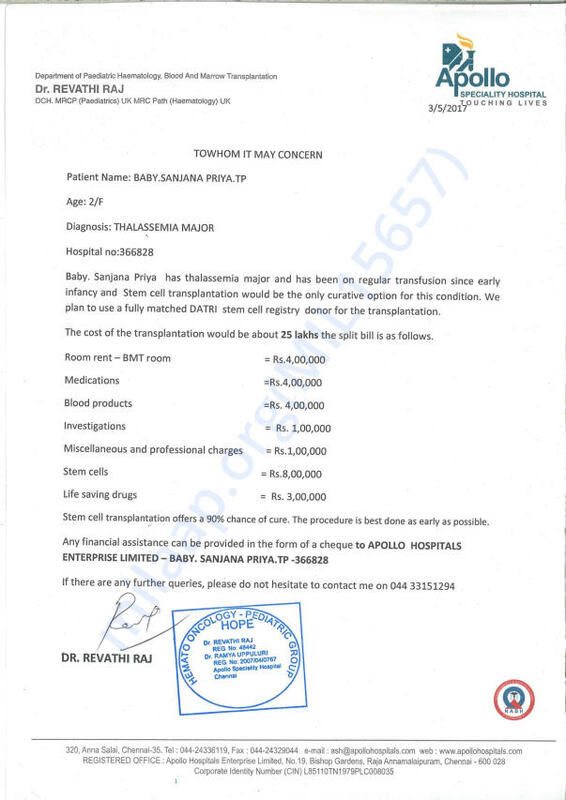 The total estimated cost of the Bone Marrow Transplantation (BMT) is Rs. 25,00,000. Somehow at the back of my mind I know that I wont live a long life but I wish to live a happy life for the number of years left in my plate. 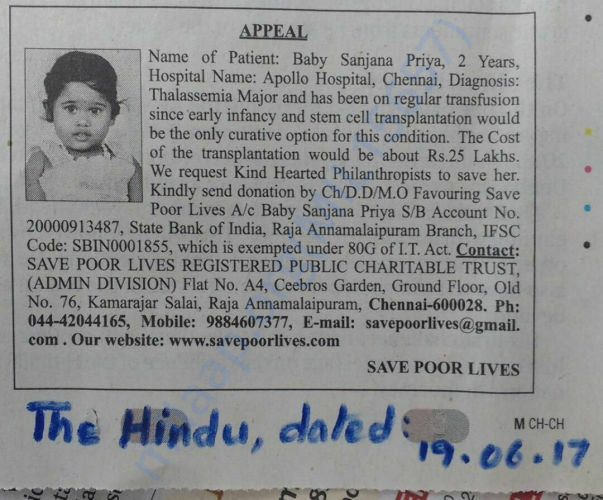 I request you to please help my father as much you can with your valuable contributions. I will be very grateful to you all for your well wishes. God Bless you all. For further details you may contact me by clicking on ' Contact Organiser' button below. You can make a contribution by clicking on the 'Donate button' on this page. 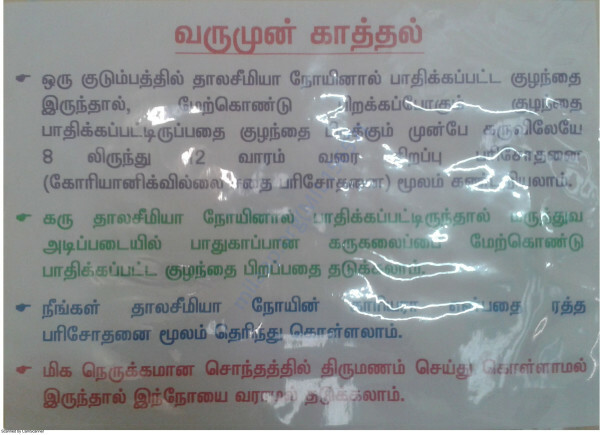 I have also attached Apollo Hospital's 'To whom it may concern' letter here. 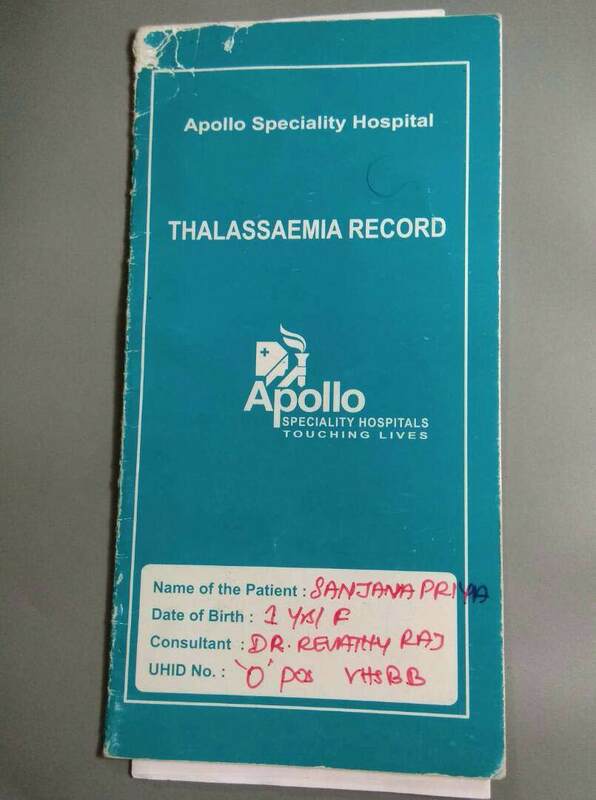 We have an update on Sanjana Priya.We are very happy to inform you that she has completed ONE YEAR of Stem Cell Transplantation. According to Doctor's advice, monthly check up and treatment is still going on. We will keep you posted on child's progress. Please do share this campaign further with your friends and family and do pray for her health. We are wishing you Happy Christmas and advance Prosperous New Year and Pongal. Once again thank you very much for your prayers and support. We have an update on Sanjana Priya. She was admitted to Apollo Hospital two weeks ago. She has completed her five days of Chemotherapy and there are no side effects and is showing progress. According to Doctor's advice, her stem cell transplantation will begin in a few days. There is still a long way to go. Once again thank you very much for your prayers and support. We will keep you posted on child's progress. Please do share this campaign further with your friends and family and do pray for her health. 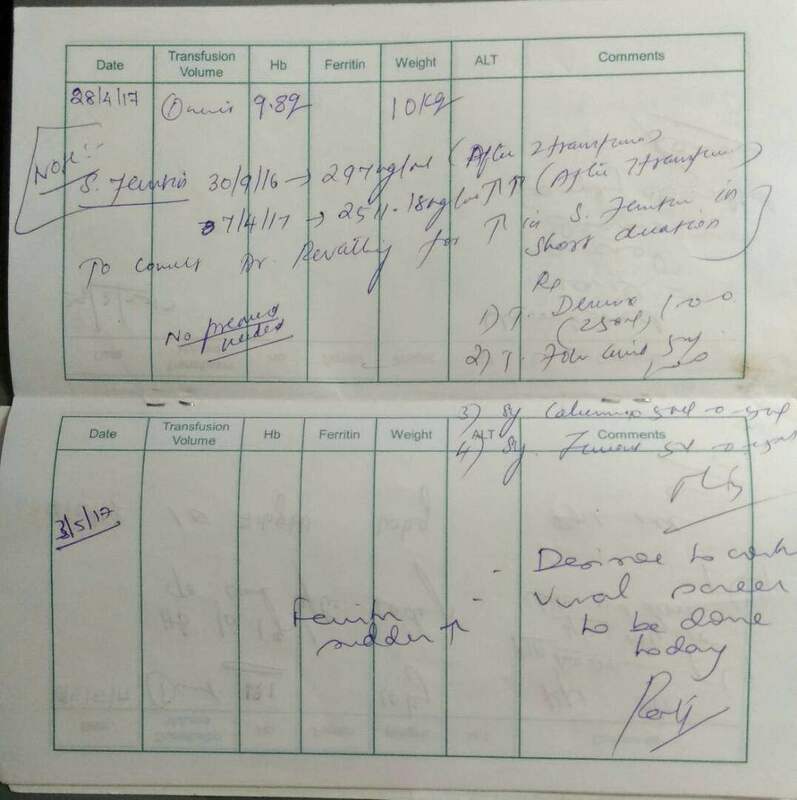 Dear Supporters, We went for a scheduled check up to the consult Dr. Revathi Raj on 7th June at Voluntary Health Services (VHS) Tharamani, Chennai. The doctor had advised her to undergo a Bone Marrow Transplant as early as possible. 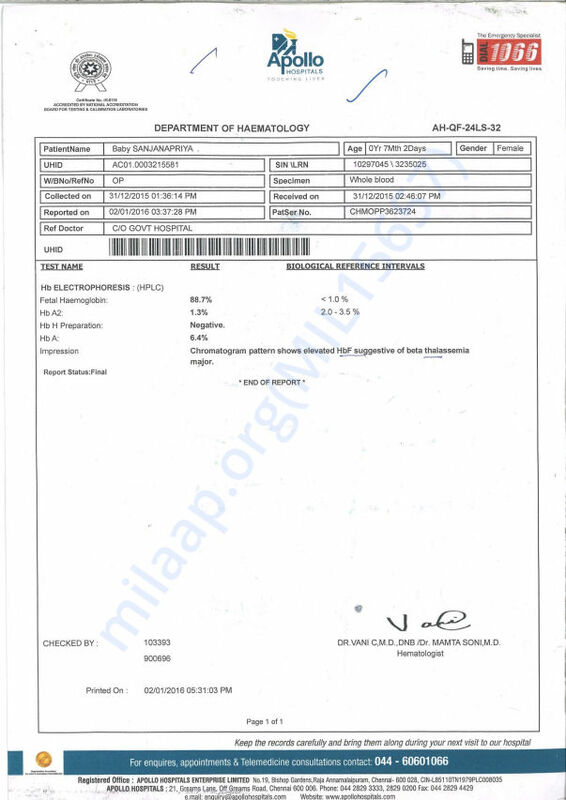 Increased Ferritin (Observed Value: 2511.18 ) is seen in iron overload as in multiple Blood Transfusions, hemochromatosis and anemia of chronic disorders like liver disease etc. Some of the symptoms are high fever, continuous vomiting, and low hemoglobin count. So the doctor advised us to give the Dosage of Desirox - 500 to level the iron and we go for review and blood transfusion 30th of this month. Thank you once again for coming forward. We will keep you posted on the child's progress.